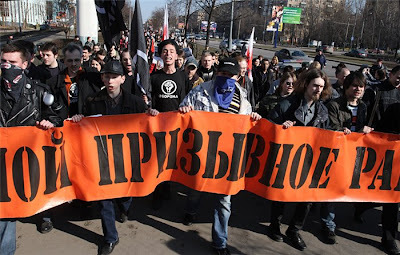 On March 25th, as shown above, Oborona’s Moscow and St. Petersburg members participated in a March for a Volunteer Army. The March culminated with a concert at the TV tower, and then dispersed. On the way ot the subway station, a gang of thugs attacked several members, but did not succeed in provoking us to violence as was undoubtedly their aim. We, citizens of Russia, believe that service in the army should be voluntary, and that the institution of draft-slavery is an unacceptable anachronism in a modern society. Those who are not inclined to military service can serve their country in other ways. Universal military conscription must end now! We believe that a strong army can only be made up of volunteers, not conscripts consisting of poorly trained and equipped slaves who are often subjected to torture and murder, always victimized by officers looking for free labor. We, the citizens of Russia, demand a strong army. A volunteer army is a strong army! We demand immediate changes in the legislation of the Russian Federation on Military Duty and Military Service, deleting all provisions relating to forced conscription, the repeal of the articles of the Penal Code applicable to draft evasion, the cessation of all criminal cases under this heading, and full amnesty for all convicted this article. We demand the immediate cessation of the so-called “raids on fugitives from the call,” especially given the fact that many victims of these raids have legitimate deferment or exemption from conscription. In fact, we strongly demand the cessation of criminal mass kidnappings for recruitment by illegal means. We can change the situation in the Russian army. We can say “NO” state arbitrariness. All that we have to do is . . . say it loud and clear as one.